The second call for abstracts has just been release for the PRCCC to be held in Melbourne over 29 September 2010 – 1 October 2010. I’ve reproduced it below and full details are available on their website: www.climatechange2010.org. The invitation and call for abstracts for the Practical Responses to Climate Change Conference which is sponsored by the Engineers Australia National Water Committee has just been announced. See the letter from the conference chair that is reproduced below. Location: Hilton on the Park, Melbourne, Australia. On behalf of the organising committee I would like to invite you to the inaugural Practical Responses to Climate Change Conference, taking place at the Hilton on the Park, Melbourne from Wednesday 29 September to Friday 1 October 2010. The Conference Practical Responses to Climate Change will provide a forum for presenting comprehensive responses to climate change within the water sector with particular emphasis on recent climate change science and impact research, vulnerability assessment techniques and adaptation strategies. It will be an excellent opportunity for engineers, scientists, planners and academics to present and debate current and future practices for adapting to changes in our environment from the catchment to the coast. The Conference Program will focus on five streams; Coasts & Estuaries, Water Resources, Catchments, Floodplains & Waterways, Planning & Policy, explored in detail by a body of reputable and informative speakers. Abstract submission closes on Thursday, 2 April 2010. For further information on the Conference Program and a breakdown of each of the above topic’s sub categories please visit the Program page of the Conference website www.climatechange2010.org. 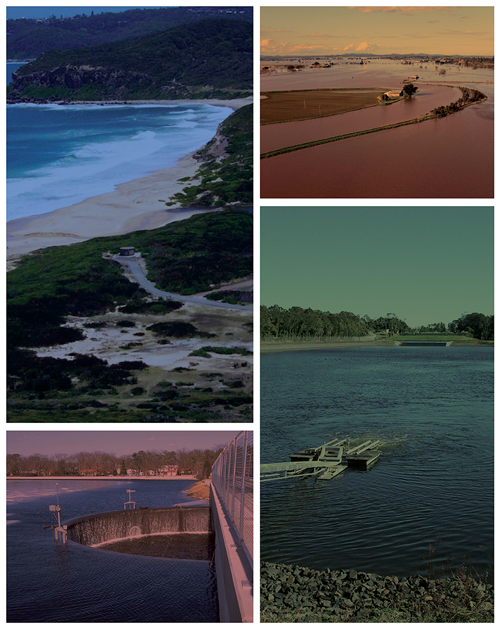 On behalf of the organising committee and Gosford City Council, it is my pleasure to invite you to join us at the 50th Floodplain Management Authorities (FMA) Conference, to be held at Gosford on the Central Coast of New South Wales from 23-26 February 2010. Being the 50th Anniversary of the FMA, Gosford 2010 will celebrate what has been achieved and look forward to the new challenges ahead of us. It will not be just about emerging issues in floodplain management, but will be a balanced discussion of practical, on-ground floodplain management and the policies and programs that impact on floodplain management across New South Wales, Australia and the globe. Gosford 2010 also provides a fantastic opportunity to experience Gosford and the Central Coast. Home to the ninth largest urban area in Australia, the Central Coast includes many world-class beaches and national parks, providing an exciting backdrop to the 2010 Floodplain Management Authorities Conference, and associated social program and field trips. The Gosford 2010 program will feature a number of outstanding national and international speakers, concurrent sessions, workshops and poster presentations. It will attract over 250 delegates from Australia and beyond and provides a wonderful opportunity to meet and extend contacts. Delegates will include Commonwealth, State and Local Government representatives, research and education organisations, managers, planners and engineers, non-government organisations, user groups, Aboriginal groups, community organisations, and the business community. I look forward to welcoming both new and returning delegates to this exciting landmark event.